With as much draft capital as any team in the league heading into the 2018 NFL Draft, the Cleveland Browns were always going to come away as ‘winners’ from the weekend. When it was all said and done though, they were winners in our eyes for more than simply the accumulation of nine new players. The Browns first seven picks were all seen as good value compared to PFF’s draft board as they managed to snag six of our top 100 players. Baker Mayfield going No. 1 overall was one of the surprises this week, but he’d been the top player on our board ever since mid-October last year. They later added one of the biggest steals of the draft in receiver Antonio Callaway. The former Florida wide out is as talented a receiver as there was in the class, but off-field issues dropped him all the way to the fourth round. For even more information on who the Browns drafted and possibly some undrafted free agent players who could make the team, grab a copy of our 2018 NFL Draft Guide with expanded profiles, scouting reports, PFF signature stats and extensive details on over 300 players you cannot find anywhere else. 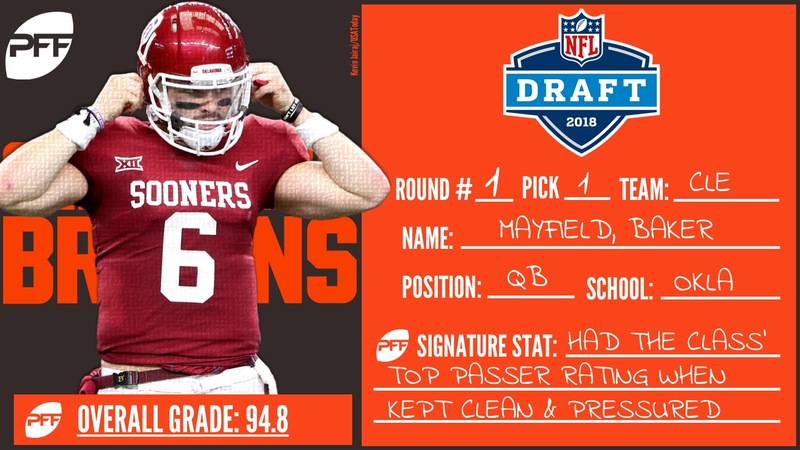 After months of smokescreens, the Browns settled on the player with the two highest graded seasons we’ve ever seen from a quarterback in our college grading. Mayfield is far from a perfect prospect, but his on-field performance at the moment is in its own realm among this quarterback class. Mayfield led all FBS quarterbacks in passer rating this past season from clean pocket (143.8) and when he faced pressured (111.6). This one got the proverbial PFF stamp of approval in a big way.